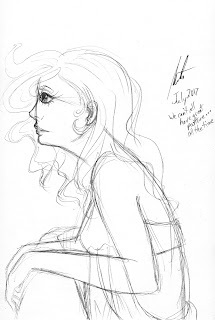 5 minute sketch - I thought it might be good to practice a little bad posture on purpose. Usually it's an accident when the posture or shape of the back curve looks weird but for this drawing at least, it was meant to be. I wanted her to look a little... shy?